Having a medical procedure done in a large hospital can be nerve racking. Having to deal with all the medical drama at a hospital can increase a patient’s stress level, this is why so many physicians are opting to perform more procedures in their offices. Thanks to advancements on the medical front many patients find themselves simply being able to go to the office to have the procedure done. One procedure that a man or woman may have to have done is a cystoscopy and thankfully many doctors are offering an in-office cystoscopy. This procedure is completed to look for any abnormalities in the bladder, stones, inflammation, tumors or any other kind of problem that may be located in the bladder. As we have discovered over the past few months, not all Urologists have a video tower in their office due to the high capitol cost to acquire and maintain this high-end video equipment. In many cases Urologist are resorting to “direct vision” utilizing the eyepiece of the scope “directly” to evaluate and diagnose their patients. The WiCAM® wireless camera system is a very cost effective tool that enables a urologist to view the inside of the bladder and urethra in great detail. The image can be viewed on a tablet and simultaneously viewed on a larger monitor if the physician prefers. The 10 oz. camera head and LED light source provide a completely untethered experience for the physician. Unencumbered by video and light cords this wireless system allows for complete freedom of movement. 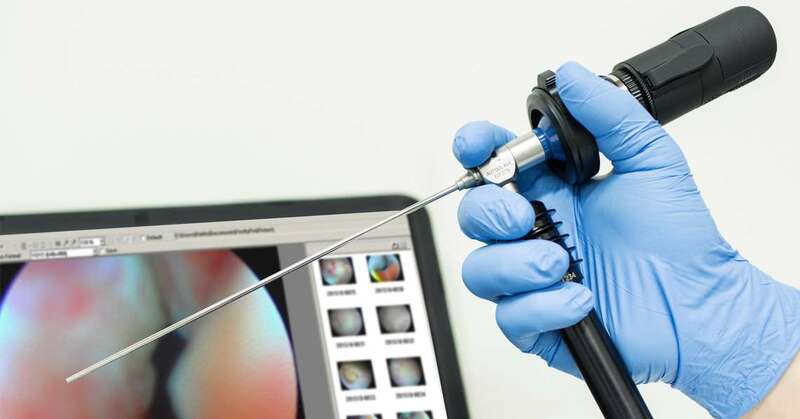 The camera’s universal coupler will attach to any rigid or flexible endoscope. Both the wireless camera and LED light source are powered by rechargeable lithium ion batteries. Utilizing advanced technology, the camera streams high quality live video at 30fps to a tablet or notebook PC enabling the physician to view, store, recall and data file transfer images and videos to the hospital EMR system. The entire system is driven by proprietary software designed and developed by The Prometheus Group. In recent weeks the WiCAM® system has been requested and utilized as the visualization system for therapy deliver during dozens of in-office BPH (Benign prostatic hyperplasia) treatments all across the country. WiCam™ has been employed to deliver Botox injections for OAB (Overactive Bladder) as the marketplace for this unique wireless camera continues to develop and grow. The WiCam™ wireless system has applications in both Gynecology and Urology, the device’s small footprint provides unequaled flexibility and mobility. Effortlessly rotate the system from one procedure/exam room to the next. Easily perform an endoscopy procedure on a patient when the endoscopy room system is occupied. Carry the system from one practice location to the next or do procedures off-site for non-ambulatory patients. Utilize the system in physical space critical situations, or simply use the system as a very cost effective back up to your existing one. If you are interested in getting more information or if you would like to schedule a WiCAM® evaluation in your facility, please contact me directly.